REACH is a strictly technology-oriented and data-driven project. 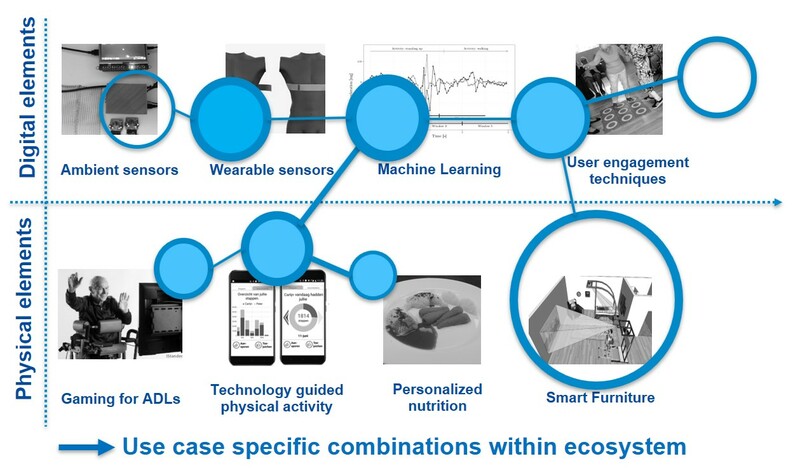 Nevertheless, to put technology-based solutions into practice and generate acceptability and adoption, which is the key prerequisite to make an impact in an ageing society on the user side, REACH follows an ecosystem approach, translating a set of generic elements developed by the partners (i.e., the REACH toolkit: ambient sensors, wearable sensors, smart furniture, behavior change techniques, monitoring and data processing, machine learning schemes and algorithms, platform and data management elements, games and apps, training and therapy schemes, etc.) into context-specific configurations that fit seamlessly into each setting’s ecosystem. REACH demonstrates with its four Touchpoints (each deployed in a specific real-world use case setting with significantly different reimbursement regiments and stakeholder networks, meanwhile reflecting a range of care environment typologies: homes, day-care centers, rehabilitation facilities, hospitals, etc.) that it can, based on a shared set of elements and principles, generate substantially different solutions that react on the socio-economic context. Backed by its data-driven approach and its partners’ outstanding expertise in the field of user experience and digital engagement, REACH goes as part of some solution instances and develops even a step further trying to crack the code for the maximization of its impact through user-specific but technology-facilitated personalization.